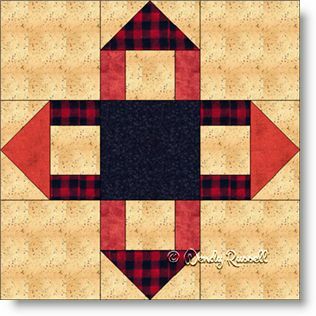 The Formal Frame quilt block is a simple nine patch block comprised of only squares, rectangles and flying geese units. This would be a good choice for a new quilter to practice the flying geese patches as well as working on your precise quarter inch seam allowance, especially for the patches containing the rectangles. This block reminded me of the Folded Corners block, where the pieces look like a corner of the fabric is folded down to show the underside. Depending on your choice of layout of the blocks, you can come up with some really interesting quilt designs. Here I have illustrated two examples.